AC Milan v Inter Milan, Celtic v Rangers, Real Madrid v Barcelona, Brighton v Crystal Palace. These are all well established rivalries that everybody knows about and can talk about until the cows come home. Up until a fortnight ago, I didn't know of another great footballing rivalry in the Northwestern United States. My article on the Seattle Sounders a few weeks back sparked a bit of banter between the good people of Seattle and Portland. Their rivalry is one of the few true derbies that is present in American football/soccer. We've heard all about the Sounders, so in the interests of fairness, it's now time for the Portland Timbers right of reply. Which division to Portland Timbers play in? The Timbers play in the United Soccer Leagues First Division, which is one league below Major League Soccer, though the leagues have no connection to one another, and there is no promotion or relegation. How will that all change in 2011? 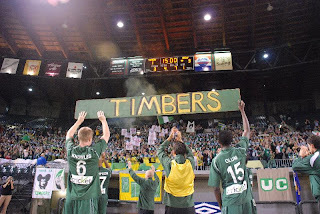 At the end of 2010, the Timbers will fold or transfer their franchise to another city, as will the Vancouver Whitecaps, who play in the same league as the Timbers, and will also have a Major League Franchise in 2011. This will be similar to what happened to the Seattle Sounders after the 2008 season, when their franchise was transferred to Bremerton, Washington, just west of Seattle, and re-branded themselves as the Kitsap Pumas, and play in the USL’s Premier Development League, which is a mostly amateur league two leagues below the First Division. The new team will carry on the name, and possibly some of the current players will come over to the new team, but technically it will be a new franchise, the fourth incarnation of the Portland Timbers. How does soccer compete with other sports teams in Portland like the Trail Blazers (basketball), Winterhawks (ice hockey) and Beavers (baseball) in terms of crowds and exposure!? The Trailblazers, who are the National Basketball League team, are obviously the top team in town, and pretty much determine how the local sports scene works. But the Trailblazers (as well as the Winterhawks, who are a popular junior ice hockey team) both play in the winter, so the Timbers only directly compete against the Beavers. They are a AAA baseball team (one league down from Major League Baseball, as the Timbers are from MLS) and are owned by the same owner as the Timbers are, but their attendance has not grown in recent years in the same way as the Timbers have. 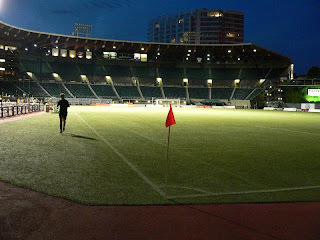 But the current owner is determined to find them a new home when PGE Park (which the teams share) is renovated to be more appropriate for soccer. Do you get much coverage in the Oregonian Newspaper? This has been one of the most difficult parts of trying to grow the attendance for the Timbers. The simple fact is that the local media gives us very little attention. The local TV stations will sometimes give scores of the matches, sometimes show highlights (for home matches only), but sometimes ignore us completely. The local newspaper (we have only one daily paper) is also inconsistent, and on one occasion, for an important rivalry game at PGE Park against Seattle a few years ago, completely ignored the game altogether, only posting a copy of the team press release the day after. We have a weekly paper that gives us better coverage than the daily paper most of the time, but for the most part, the coverage in the local media is inconsistent and disappointing. I think that’s one reason the Timbers fans have built such a large web presence, in an attempt to fill in the gap where we feel the local media have failed us. How much does it cost to watch the Timbers? Season tickets start at $150 for a season ticket (15 home games) for general admission, which is where the Timbers Army support group is located. For reserve seats along the sideline, they can go as high as $330 for a season, which includes waiter service to your seat. For many of the games, the general admission section behind the north goal has many more people than the reserved seats do. What's been the greatest moment in Timbers history? This is the third incarnation of the Timbers, going back to their North American Soccer League days of the mid-70’s, but for the current team, who started play in 2001, the greatest moment is probably when forward Fadi Afash back-heeled in a goal late in the last match of the 2004 season which was the game winner over the Milwaukee Wave United and secured the Timbers the top of the table for the 2004 season. Unfortunately in the USL First Division, the league champion is not the regular season champion, but the winner of the playoffs, which we did not win, but the goal is famously known as the “Sunshine goal” (which is a long story, related to the singing of a song and Timber Jim ) and is probably considered the single greatest moment in modern Timbers history. But if you consider the greatest game, that would probably be what is known to Timbers fans as the “Chainsaw Massacre” which was earlier in 2004 against the same Milwaukee team, when the Timbers were brought back from a late 2-0 deficit by rookie Alan Gordon (who now plays with the Los Angeles Galaxy along with David Beckham) who scored a hat trick to earn a 3-2 win. Gordon then famously sawed off a slice of the Timbers log himself after the match. See my later answer about Timber Joey for a further explanation of the Timbers log and it’s significance. What is PGE Park like and do you share it with other teams? PGE Park was built in 1926, underwent a significant upgrade in 2001, and is a partial horseshoe shape that has accommodated just about every sport that can fit into it over the last 83 years. It is the only stadium in the world to ever host events in two consecutive World Cups (either men’s or women’s) when it hosted matches in both the 1999 and 2003 Women’s World Cup. It also hosted Pele’s last professional match, which was the Soccer Bowl ’77 North American Soccer League Championship match. It seats just under 20,000 in its current configuration, though the restrooms and concessions limitations mean they will cap the attendance at about 16,000. It’s expected to hold somewhere around 23,000 once the MLS renovation is complete. Half of the stadium sits below street level so it can be a very loud stadium, but I think Timbers fans love the stadium (especially since the renovation) and when there were rumours years ago of possible plans to have a new MLS team in a new stadium instead of PGE Park, the idea was met with almost 100% resistance from Timbers supporters. We love our stadium, and look forward to the renovations for MLS for 2011, which mostly involve completing a grandstand along the east side which will make a complete horseshoe shape from along the west sideline, around the north goal and all the way down the east sideline, which is currently open to accommodate the baseball configuration. A packed PGE Park for the visit of Puerto Rico Islanders on 23:07:09. (click to enlarge image). Note the small 'patch of dirt' on the bottom right hand corner. That is the home plate area from where the baseball pitchers do their thing. Work is in progress to lay down a section of turf in it's place. Is it one of those out of town stadiums? PGE Park sits on the west side of downtown Portland and is directly on the city’s light rail system, and since there is very little parking around the stadium because it is right in a neighborhood, a very high percentage of the fans for a game reach PGE Park this way. There are very few stadiums left in the United States which could survive with this type of arrangement but it works fine here. The Timbers Army had their foundation before the most recent Timbers even played a match, when local fan Steven Lenhart was passing out cards at local bars, trying to get together fans first to watch US National Team games, then to support the new Timbers team that we knew was coming in 2001 (the new team was announced in 1999). In the first few years, they were known as the “Cascade Rangers”, which is not a reference to the Glasgow club, but to the local Cascade Range of mountains. 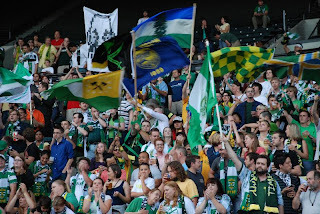 Sometime in the second season (none of us remember exactly when), the name evolved to the Timbers Army, and the supporters group has grown from less than a dozen early in the first season, to several thousand for most of the matches nowadays. They do not have membership, or a leader, or any type of fees, and most projects (like scarves, bus trips, banners, etc) are organized by individual members, and funded through the sale of Timbers Army merchandise they create themselves, our out of their own pockets. The Timbers Army have been criticized at times for the language of a few of their chants, but the relationship with the Timbers front office has improved greatly over the past few years, to the point that this season, the Timbers Army were allowed to create their own official logo, which the team then featured on the sleeve of the kits for the Timbers new U23 team, which played this season in the Premier Development League (mentioned earlier). The Timbers Army welcome their Japanese players onto the pitch. Do you get much singing/chanting at games? 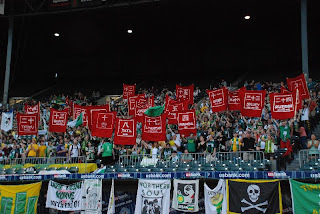 The Timbers Army chant and sing almost constantly when the match is in play, and often for many minutes before the start and after the conclusion. A few years ago, on our message board, a survey was taken of the number of unique chants the Timbers Army have used, and at the time, the count was well over 150, though they have some favorites that are chanted multiple times a game. Most of their chants are derivatives of chants other teams use of course, but they have some original ones as well, and have lately been fond of using popular pop song’s from the 80’s and changing their words to become a chant. A recent example is “We’re Not Going To Take It (Anymore)”, a popular 80’s song by Twisted Sister, changed to “We’re The Timbers Army (Who are you?)”. Apart from the Seattle Sounders do you have any other rivals? The Vancouver Whitecaps have also been a rival since all three teams were in the NASL back in the 70’s, but the rivalry has never been as intense as it was with Seattle, probably because Seattle is only 3 hours drive away, while Vancouver is a 6 hour drive from Portland. To get an idea of the isolation of the three teams in the northwest, the driving disctance to the next-closest USL First Division rival is in Minnesota, which is 1,732 miles from Portland. Let's hear it then, there appears to be some rivalry going on with the Seattle Sounders. What's your take on things!? Of course it’s a rivalry that goes back to earlier incarnations of both teams that played in the NASL back in the 70’s, and when the Timbers returned in 2001 (the Sounders having been reincarnated in 1994), the rivalry returned, and for the first few years, it was a pretty friendly rivalry. The interesting thing that happened is that the two teams went in different directions, and the supporters had different reasons to be proud of their team. For the Timbers, it has been the growth of the fan base and the supporters section, which in recent years, has been growing at a very healthy rate, with total attendance growing at over 22% per year over the past two years, to 8,500 per game, which is second largest in the league. For Seattle, they have had great success on the field, with two league titles during the time both teams were in the USL First Division, and knocking the Timbers out the playoffs twice, but their attendance was always near the bottom of the league, barely getting above 3,000 per game, even when they moved to the cavernous brand new Qwest Field. I think for Portland fans, the fact that Seattle could never build their fan base even with multiple championships was a constant source of amusement, while for Seattle fans, the futility of the Timbers on the field (who have never won a title of any kind, other than the 2004 Regular Season Championship) gives them great pleasure. 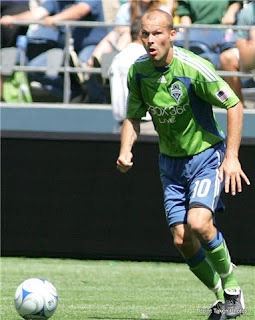 Now in 2009, suddenly a new incarnation of the Sounders begins in MLS, and their attendance jumps by 10 fold. Whether it’s the appeal of MLS over the USL, or some amazing marketing by the Seattle front office, I don’t think that anybody knows. But it’s also been a great aid to the Timbers MLS campaign that going to MLS can significantly boost attendance, and a similar situation happened in Toronto to a lesser extent a few years ago, though in that case, the previous team played under a different name at a different stadium. My take is that what has happened in Seattle is impressive, and you can’t argue with the numbers, but I also think that the Seattle model is one that we don’t want to follow in Portland. The nature of support in Portland has largely been a fan-based initiative, and its best example is the fact that most of the scarves that you will see at Timbers matches (well over 95% I would guess) are fan-created scarves, including 5,000 green and white Timbers Army scarves, while scarves sold from the Timbers store are relatively uncommon. In Seattle, the front office gave out the “rave green” scarves with the season tickets, which is something you would never see happen here, but it’s impressive when 30,000 fans all hold them up at the same time, there’s no doubt about that. But I think that the success in Seattle, and I would expect both Portland and Vancouver will also have packed stadiums starting in 2011, has changed the face of how support of soccer is viewed in the United States (and Canada), no matter which approach the teams and their fans take to achieve it. As to why the rivalry seems to be taken on such a personal level by the supporters, maybe it’s because both sets of supporters seem to enjoy telling each other how they are jealous of what each team has, which I think is ridiculous, but I do believe that once both teams are in MLS in 2011, it will be a rivalry unlike any that MLS has ever seen. Will we have to wait until both teams are in the MLS in 2011 before we see the two sides play each other? They have already played each other, on July 1 this year in Portland, in the US Open Cup which is roughly the US equivalent of the FA Cup. Seattle scored very early, then added a second goal before the Timbers pulled one back in what was a pretty even match overall, but the Sounders ended up winning 2-1. It was the first sellout at PGE Park (at a slightly reduced capacity until we get our MLS upgrade) and was our largest-ever crowd at 16,382. 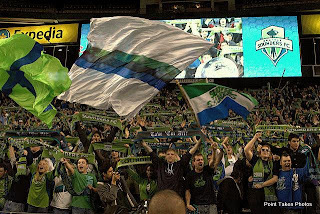 It was great to see a large presence of Sounders fans as back in their USL days, they had never brought more than about 50 fans, and they had easily 10x that or more who made the 3 hour trip down. It’s possible the teams could meet in the US Open Cup next year as well, since pairing of the teams is done regionally to reduce travel costs. Is there a general rivalry between the people of Portland and Seattle or is it just a soccer thing? They are very different cities, with Seattle being slightly larger, but both are geographically isolated from the rest of the major cities in the United States so I think a rivalry is natural. On the sports front though, the USL and soon-to-be MLS rivalry is greatly enhanced by the fact that in the four major sports in the US: NFL (football), MLB (baseball), NHL (hockey), NBA (basketball), there are no rivalries between the cities since as none of those leagues have teams in both cities since Seattle lost their NBA team recently. Tell me about Timber Joey (the club mascot), does he really wield a chainsaw around the field? 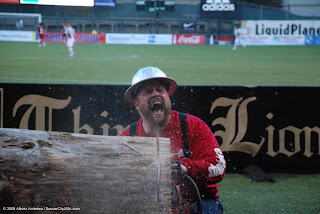 Timber Joey is a real lumberjack who does cut off a slice of the log every time the Timbers score and gives them to the player after the match (as he does for the keeper if he records a shutout), and uses his chainsaw to excite the crowd. His name is Joey Webber and he actually took over the role from the legendary Timber Jim (Serrill), who started his association with the Timbers back in the 70’s, and when the Timbers returned in 2001, so did Timber Jim. He tried to retire a few times but we wouldn’t let him leave, but finally at the season opener in 2008, he finally retired and by mid-season, Timber Joey had taken over the role. Timber Jim is now a regular in the supporters section, and occasionally will move down in front of the supporters section to lead them in a cheer. 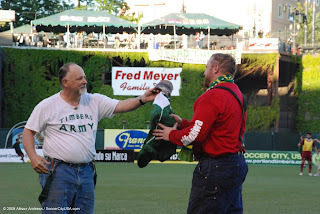 Timber Jim is a legend to the Timbers fans and has always been considered the heart of the franchise, but Timber Joey has been embraced by the fans as well. The fact that both Jim and Joey are real in that they do this for their career is something that is pretty unique as well. That’s why we don’t really consider them to be “mascots”, since they are not just a representation of what “Timbers” means to our city and our region. They are the real thing! ...who does this everytime the Timbers score. What's not to like!? What music do the Portland Timbers enter the field of play to? Players are introduced as they come out of the tunnel, but there is no music played while they are doing so. Do you play music in the stadium after a goal is scored? No music is played during the match at all. 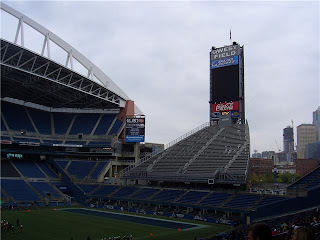 Unfortunately, many stadiums in the US play music not only after the goals, but while play is underway, which effectively mutes out any noise coming from the supporters. So this is something that will never happen in Portland because our owner understands that it just won’t work here. I think the fact that music has never been played in Portland during our matches has greatly contributed to why our supporters group has grown the way that it has. There are still several teams in our league who have to deal with loud music played over the loudspeakers during the match in an attempt to “pump up the crowd”, when it fact the effect is exactly the opposite. What is the club anthem? We don’t have one officially, but our own version of “Blue is the colour” called “Green is the colo(u)r” was recorded back in the 70’s and is still played occasionally while the fans are filing into the stadium. Do you have any celebrity fans? None that come to mind, though the rich history of soccer in Portland, plus the presence of the University of Portland, which is a top college soccer program, especially their women’s program, brings many national team players and coaches to the games now and then. It’s not unusual to see them seated in the corner suites during the matches, or sometimes even among the supporters. What is the biggest selling item in the Pro Shop? No single item stands out as far as I can tell, but the Timbers have featured a distinctive third kit in each of the past three years, and this year’s black hit has proved to be very popular. As mentioned before, the fact that so many scarves, t-shirts, flags, and similar items are produced by the fans undoubtedly affects the amount of items sold at the team store. And the most tacky item they sell in there? As far as I’m concerned, anything that says “soccer” instead of “football” is tacky, but that’s just me (and me as well - Ed). But I guess sometimes you have to go with the flow, as my use of “soccer” instead of “football” for most of my answers will indicate. 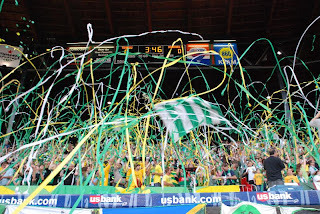 Also, I think most Timbers fans think vuvuzellas should be banned, as they are sold in our store as well, and as we all know from recent history, they can ruin a stadium’s atmosphere if enough of them are present. Presumably with the distances involved you don't receive or take many away fans to matches? Timbers fans have always been the best traveling fans in the league by far, and just about every road game, even in Puerto Rico, will draw a few Timbers fans to it. We used to take several hundred up to Seattle when they were in our league, sometimes 50 or more to Vancouver, and often more than a dozen will travel to places like San Jose for a pre-season game with the MLS Earthquakes earlier this season, or to places like Charleston on the east coast, a good 3,000 miles away. We like a beer with our football here in Europe, is it true that Portland has 28 (twenty eight!) breweries? Portland is famous for being the home of microbreweries, though I don’t know the exact numbers. Many pubs have their own breweries, so many beers can only be found at one location (where do we sign? - Ed). What is the beer of choice for the locals? The large number of microbreweries means the taste is quite varied, and a few pubs even feature beers created just for Timbers fans, including Timber Jim Lager. Do you have a view on David Beckham? I think like most American soccer fans, it was exciting to see him commit to helping promote the sport in the US when he joined the LA Galaxy, but disappointed that he has seemed to back off on that commitment. Of course to Timbers fans, he wouldn’t’ have any success at all in LA if he didn’t have two excellent former Timbers to serve his passes up to, as both goals scored off Beckham assists against AC Milan last week were by former Timbers Alan Gordon (see “Chainsaw Massacre” above) and Bryan Jordan. Have you ever been over to Europe for a football match? In 2006, 31 Timbers Army members traveled to the UK and saw two matches as a group: Sunderland at Manchester United and then when Newcastle United came to the Stadium of Light a few days later. The Timbers fans formed a great relationship with the Sunderland fans after the Black Cats visited us for an exhibition in 2005 (which was a 0-0 draw) and Sunderland supporter Gary Lamb organized the trip for us to visit in April, 2006. We were amazed at the silence of the Man U supporters (maybe not surprising, they were being held to a 0-0 draw by Sunderland at home) and equally amazed at the passion at the Sunderland/Newcastle derby match. The Timbers fans were featured on BBC North, welcomed by the mayors of Seaham (where they were staying), Sunderland, and by Sunderland legend Gary Rowell. So there you have it. Where would football be without rivalries eh!? It's a very healthy thing as far as I'm concerned as long as it doesn't spill over into physical or personal abuse. Passion, banter and vociferous support is what's football is all about. Both the Seattle Sounders and the Portland Timbers appear to have this in abundence which is why they've come to our attention. One thing is for sure, when these two teams finally meet again in the 2011 MLS season, European Football Weekends will be arranging a trip over to the game. Who to support though!? I'm guessing the majority of fans would rather pull their eyes out than attend an over priced pre-season friendly. They are normally turgid affairs and generally nobody gives a rats arse about the result aside from a few nutters. Hi ya. To further cement how football is in a period of eating itself, Grays recently charged £20 for the 'privilege' of seeing West Ham reserves and Barnet asked for a whopping £27 to see and Arsenal XI. Madness, madness they call it madness. After a bit of fun this week on European Football Weekends with articles on Aberdeen and Seattle Sounders (a piece that sparked off a new American Civil War between the residents of Seattle and Portland) it was back to the bread and butter in the form of a trip to Park View Road, Welling. Gillingham may be Kent's only football league club but if you think that's all they've got to offer the world of football you'd be very wrong. Dartford, Dover Athletic, Maidstone United, Tonbridge Angels, Ebbsfleet United, Welling United to name but a few all reside in the garden of England. It's a chuffing footballing hotbed. The week before this match, Welling United's annual friendly with Charlton Athletic attracted a crowd of 2,200 which is four or five times their average for a Conference South game. With that in mind it's not surprising the club try and shoe horn in as many friendlies as possible against league opposition. Fair play to them. The way Charlton Athletic are sliding down the divisions, it won't be long before the are playing them in the same division. This was one of the best days in the sporting calendar. The Open was taking place in Scotland, England were dishing out a spanking to the Aussies at Lords here in Kent we had sultry day in which to enjoy an afternoon of football. Such is the set up at the stadium, when the football got boring you could pop your head over the wall and watch a bit of cricket in the adjacent Bexleyheath Sports Ground. Buy one get one free. What's not to like!? Football to the left, cricket to the right, here I am stuck in the middle with you. Park View Road is also the home to Erith and Belvedere FC. An embarrassment of riches. Prior to match, Cynical Dave and I met up with Mr Fuller for some welcome beers. The public house of choice was the Nags Head in Welling High Street which was cheap as chips AND had a working hand drier in the latrines. A winning combination in my book. I'm not sure how many beers Cynical had but upon leaving said pub and entering the ground, the first thing he did was start waving the corner flag around. Mr Fuller and Cynical dig deep for the £10 entrance fee. Gills trialist Jordan Parkes poses for a photo. EFW man of the match. Wings keeper Charlie Mitten. Corrugated iron roof stand (tick). Bit arty after a few pints - Ed. The first thing that struck me inside - other than Dave being a loon - was the splendid corrugated iron roof on the main stand. Identikit modern stadiums have almost made these extinct. Can you name any other grounds past and present that have sported a large amount of corrugated iron!? Hands up who wants to hear about the actual match (silence - Ed). Just briefly then; both keepers had outstanding matches performing flying acrobatic saves willy nilly. You expect wholesale changes in terms of substitutes during these games but kits!? Welling changed theirs at home time from white to blue. It seemed to do the trick because in the second half they dominated their most illustrious visitors and ran out easy winners courtesy of two goals from Sanchez Ming and Jake Hobbs respectively. This was The Wings last pre-season game before they fly off to Shanghai for a lucrative four team tournament.....probably. They looked a good bet for promotion into the Conference on this showing but as we all know, we shouldn't read too much into these games. After a post match pint to celebrate my touch of the match ball and another on the pitch photo it was back to HQ in Brighton for our first elongated session of the season. Here's to many more. Cheers. Mental note to self: No denim or tracksuits in the executive lounge. The Seattle Sounders are about to become your new favourite team (Seattle Who!? - Ed). Let me explain. Some might breathe a huge sigh of relief when I tell you that they aren't your average MLS team. Us Europeans may already have a view on 'soccer' in the United States of America but this team differ in that - get this - they have proper passionate, vociferous fans. And relax. In a candid interview with the influential and award winning website Prost Amerika Soccer, EFW delved deeper than ever before into a club that is about to take America by storm. I realise that this has nothing to do with European football but hey, what's a continent between friends!? This could be the start of a 'special relationship'. I'd seattle (sic) for that. This is part one of a two part series on the Seattle Sounders. First up we hear from the fans and next week, we've arranged an interview with a director at the club. Aren't we good to you!? (get on with it - Ed). How much does it cost to watch a Seattle Sounders match? Season tickets started at $288 and are sold out. The club originally decided to cap sales at 28,000 but have since relented. Due to the popularity of the matches, more seats from the massive Qwest Field have been made available to general admission, and are about $18. Not expensive by the standards of US sport. Still the place holds 68,000 and they just stretch a tarpaulin over the upper deck. The beer is cruelly overpriced, and many fans choose to get tanked up in the neighbouring pubs instead (where do we sign - Ed). What sort of crowds to the SS attract (numbers wise) and how does this compare with the Seattle Seahawks, Mariners and Supersonics? The Sonics left town last season to play their basketball in Oklahoma. Currently, the Mariners are averaging 27,138 and the Seattle Sounders FC 29,715. So soccer is the biggest draw in the summer. 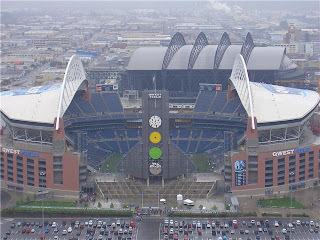 The NFL Seahawks sell out the 68k stadium, but there are only 8 home games. What is the greatest moment in the SS history to date? If you accept that Sounders FC is a continuation of a legacy, then there are some titles and trophies in a fairly successful past. Winning the USL trophy in 2007 was my highlight, but older fans will talk of NASL cup finals. I'd say that there is a good chance we haven't achieved it yet, and it may come this year. Do you have any singing/chanting at games? More than any other club in the USA. 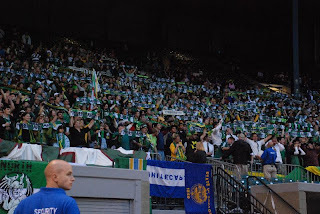 The Emerald City Supporters (ECS) have revolutionised chanting at US soccer and have created what people flatteringly describe as a "European Atmosphere' at the games. 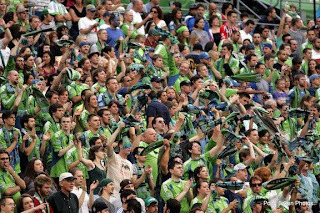 Not only are Sounders crowds the largest in the USA, but our fan atmosphere is the noisiest. Noisy AND passionate - the ECS. Not everyone loves it though, with some objecting to people standing, some to swearing in the chants, and the commercial department wondering how they can get the crowd to shut up so they can be marketed at like NFL fans. It's a battle waiting to happen. Fascinating to watch. Drew Carey is a celebrity shareholder. Big football fan. 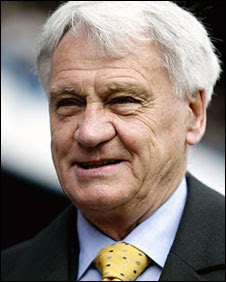 One of the conditions on which he agreed to be a shareholder was that the club had a Marching Band. It forms a procession to the game accompanied by members of the ECS who march in front of it, or behind it. It's not a bad spectacle if you haven't seen 25,000 Scots marching to the skirl of the bagpipes through the streets of Paris. Presented to some dignitary at the star of every game. A PR stunt but a harmless one. I'm still waiting to be asked! It's a nice way of getting Sounders more involved in the community. The Golden Scarf - A PR Stunt (tick), tacky (tick), I want one (tick). You have a marching band at each game? Yes. This was Drew's idea and has been very controversial with those who want to sing and chant. A massive mistake was made before the year started to put the band in the same section as that populated by the ECS. The fans didn't want them, and the Band members didn't need the aggro from unappreciative fans who had repeatedly requested they be moved. After a year of trying to persuade the responsible club official to move the band to the other end of the stadium, the ECS leaders met Drew Carey in a pub. Four days later it had been moved to the other end. But a lot of bad blood had been spilled between fans and the club due to the club's perceived intransigence, and a lot of energy pointlessly wasted which could have been used building up game day activities. There are rumours the band will be moved again. They are nice guys and girls, I feel but were used a little as a political football. They deserved better. What kit (I believe you guys may call it a 'uniform' which makes us laugh this side of the pond) do the SS play in? Rave green shirts and either matching or blue shorts. There is a blue shirt but we've never worn it. Is the grunge scene still all the rage in Seattle? Presumably SSFC trot out onto the pitch to the sound of Smells Like Teen Spirit by Nirvana? Not to my knowledge. All I can tell you about the trot out song is that it's probably not Combine Harvester by the Wurzels. It's actually a Sounders Fight song, an instrumental written by the great Henry Mancini, who also wrote the Pink Panther music. Talking of music, you must play a tune after each goal is scored? The roar of the crowd is too loud for anyone to hear. If we came over for a game, would we be able to take a bucket of popcorn and some Pepsi max (large) to our padded seats to watch the game? I'm sure we'd do what we could to indulge stereotypes. Popcorn is vile though, isn't it? Isn't that what you have to eat at cinemas in England anyway? And a packet of crisps in a size you can only buy at cinemas? Apart from myself, just Drew Carey. Joe Roth, a Hollywood producer, is the majority shareholder and he's certainly a personality. What's the best novelty item you stock in your Pro Shop? Over here in Europe many clubs have started to sell toasters that print the teams logo on the bread. Pretty impressive eh!? Nothing too crass. Soccer fans here have acquired a reputation for being a little discerning, and Seattleites are generally smarter than the rest of the country. Distributing inflatable thundersticks before a game is the silliest thing they've done, but not the daftest they've threatened to do. When Freddie Ljungberg was signed, there was a rumour they intended to put cowbells on every seat. Someone may have told them that cowbells come from Switzerland and Freddie ... doesn't. We never heard of it again. One day I'll get GM Adrian Hanauer to own up. Who are considered to be the Seattle Sounders greatest rivals? Although left lingering in the United Soccer League, Portland Timbers are the big rivals. The Vancouver Whitecaps are our friendly rivals and the fans mix together well. Portland can be a little more awkward, but by the time the two sides join us in MLS in 2011, all will be sanitised. The Pacific Northwest is set to become the epicentre of US Soccer. Presumably, with the distances involved, you don't receive or take many away fans to matches? Almost 1000 went to Portland for a US Open Cup game earlier this month, depending who you talk to. The Timbers also used to bring a few here. Sounders had over 100 in Los Angeles, but generally not big numbers. But in 2011 when Vancouver and Portland enter the league, all that will change. How many column inches would would your average SSFC match take up in the Seattle Times newspaper? The coverage has been pretty good this year because it's new. How committed they will be if the Mariners stop sucking, or in year two is a subject for much debate. Seattle does have the most vibrant soccer websites and internet users and that's where the sport is strong. Sites like mine, Prost Amerika Soccer, GoalSeattle and Sounderatheart are all very popular and the club is generally cooperative with our newsgathering, and we try to be responsible with the information we glean. You wouldn't believe some of the stuff I decided not to print. What or who is the club mascot? Over here in England, my team Brighton and Hove Albion have a man dressed in a 6ft Seagull outfit who runs around the pitch, flapping his wings and my other team Lewes can't even stretch to that due to having no money to even fund a furry 'Rooks' outfit. Sammy the Sounder I think. There is a finite point to how many gimmicks you can cram in before the game actually starts. I was reading this morning about the Raymond James Stadium in Tampa Bay and their 103 foot replica of a pirate ship they have in their stadium. In the interests of "bolstering team spirit" the ship fires out rubber footballs and confetti everytime the team scores. Any such delights at the Qwest Field? Yes, we fire out silver, blue and green shiny confetti which lies on the pitch throughout the match. Other than that, nothing really too cringeworthy. Any plans they may have had for it, have been superseded by the fan atmosphere. There are some pretty wise heads running this franchise. Sounders took many commercial staff from the NFL Seahawks and generally they get the soccer thing. Once in a while, they misjudge what soccer fans will tolerate but overall, a big thumbs up. Check out the North Stand. Crazy guys those Americans eh!? Do you get any violence at MLS matches? Never seen any. There were some incidents after 2500 Toronto fans drank their way down to Columbus on buses. More Canadians got arrested at the last Buffalo Bills game, I'm told. It's very rare. At Sounders, the only trouble I've ever heard of was caused by over bossy stewards apparently throwing their weight around, but I only heard one side of the story. It's not a big problem. Being English, I'm contractually obliged to ask this question: What effect do you think David Beckham (our Becks) has had on the MLS? It depends on how the saga ends. Most LA fans want shot of him and are now serially unimpressed with his conduct. Maybe he can win them back over with performances. Opposition fans will boo him mercilessly. If LA Galaxy fans drive him out, the self-respect of this league may increase. He put England's world cup chances above everything. As a Scotsman, I have to say that's unforgivable. Not the view of European Football Weekends obviously but some fans over here in Europe suggest that the likes of Beckham are over there for an easy fistful of dollars to help with their retirement plans. How do you react to that? Depends on the individual. I've seen the state of Freddie Ljungberg's legs after a game and he is always wrapped in ice after getting kicked up and down his legs. He doesn't need that, especially as those pins were formerly his modeling livelihood. Beckham is a one off, I can assure you Freddie and Darren Huckerby give their sides everything they have. Likewise Toronto's Danny Dichio. And finally (phew) you must be pretty excited to have Freddie Ljunberg on board this season. How do you rate your chances for the season? Freddie sold a lot of tickets but he has impressed everyone with his application. Initially he seemed to get frustrated very easily with the inabiliy of his colleagues to read his intentions, but that has worked itself out and now he plays very well with Brad Evans and London's Steve Zakuani. Freddie has been a model pro since he got here. So there you have it. 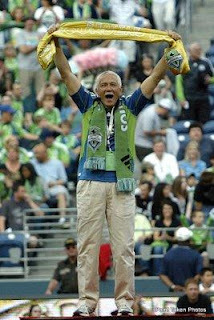 That interview has done a lot to change my opinion of the Sounders. I must admit, I entered into this with a bit of a 'sceptical stance' taking the team and the MLS as a whole to be a bit of a joke. Those answers have made me sit up and think. They could be good guys after all. A flight to Seattle to see them and join in with the fun anyone!? Sound as a pound. All photos are courtesy of the Prost Amerika Soccer and Stuart Fuller from the equally excellent Ball is Round website. Continuing our occasional series whereby we dip a toe into football fan culture, I thought we'd get up close with the biggest and best Ultra group in the UK. 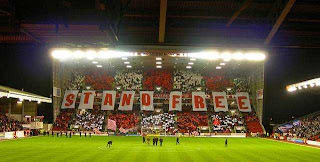 The Red Ultras of Aberdeen are in their tenth year of bringing colour, passion, noise and vibrancy not only to home matches but all over Scotland and across Europe as well. How long have the Red Ultras been established? The group was formed in 1999 and we go into our tenth anniversary year this season, a big achievement for any group. We are the oldest UK group at present. How many members do RU have and what is the criterion for becoming a new member? We have had seasons with over 200 members but not all of them were in the know with regards to the scene. Over the last few seasons we've averaged about 60 active members. We would rather have 60 lads who know the score than 200 hangers on. There's no set criteria, as long as they are aware of what we are about and what our aims are. How has the group developed over the past few years? The group has got better every season in my opinion. The displays over the last 4-5 years have been fantastic but we've now returned to the section Y of the South Stand after a dispute with the club. It's a smaller section and we are very much alone there. It means there will be less full stand card and poly flag displays but we've more freedom there. The lads can use large telescopics throughout the game, something we couldn't have done in the previous stand. 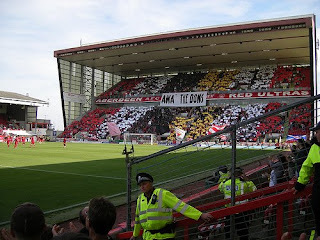 What do Aberdeen FC (the club) think about RU? Are they supportive or do they keep a distance? We communicate with the club and they have used pictures of our work over the years to advertise season tickets and games etc.. but they have also lied to us about various things. They've even lied to the police in the past when high risk fixtures come up and it can be very frustrating. We also have our own store within the ground and we are grateful for that but now they've banned displays in the previous stand and we are back in Section Y where the group actually started. We will solely concentrate on that section in the future. If we were ever asked by the club to do something elsewhere then we would refuse point blank. Do tifos and other displays have to be permitted by the club(s) or do you bring the material into stadium(s) and test the attitudes of the stewards on the day? At home games if we have something big planned, we usually run it by the club who in turn apparently run in by the police as well. In the UK things are very strict indeed. For away games we will sometimes ask ahead if we have anything planned. At some games though we just turn up with stuff and see how it goes. Do RU have any influences inside/outside of Scotland and if so why? I started the group after spending time with the ultras of Sampdoria and Genoa back at the Italia 90 World Cup. I'd say they influenced myself to start the Red Ultras. A lot of UK groups started up after witnessing our efforts. We have been very supportive to any UK group who starts u pas well. The more like minded groups the better. What are the future plans for the group? To grow in numbers and to fill our section with like minded fans but that's a very big ask. Some UK fans seem happy just to sit on their arses and do what they're told for 90 minutes. We like to express ourselves both vocally and visually. 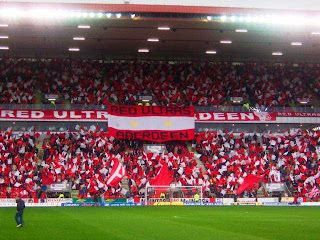 What is Aberdeen's away support like and how many of those would be made up of the RU? The Aberdeen away support is the biggest outside of the Old Firm and has been for years. The number of RU present at these away games varies but the group is always represented no matter where the team play. How do you travel to away games? Mainly by bus, mini bus, cars and sometimes trains. Do you have any rivals with other teams or ultra groups? We have rivals at Rangers, Celtic, Livingston, St Mirren and Hibs. Those are teams that have like minded ultra groups. It's NOT a violent hatred, we all try and outdo each other on the terrace rather than in the street or outside a train station ala the mad 80's. For the Aberdeen support as a whole, they despise Glasgow Rangers, that is the main rivalry and that can still kick off from time to time. What is the RU attitude to violence and do you think there is a link between ultras and violence? The group isn't about violence and it's something we wouldn't promote. I'm sure the lads - like any football fan - would defend themselves if attacked but we as a group certainly don't go looking for that. What do other - non RU - Aberdeen fans think of the group? The majority love what we do but you'll always get some fool on the internet posting this and that. That's water off a ducks back and we couldn't care less what they think. The players appreciate what we do and that is what counts. What's been the groups biggest achievement to date? 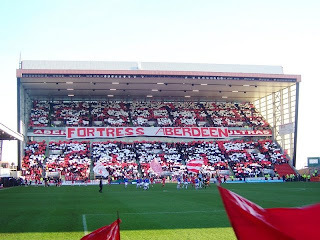 For me, the first full stand display v Rangers in 2005 was a big turning point. Since then there's been loads of great actions home and away and even away from home in Europe. We played Bayern Munich in the UEFA Cup in February 2007 on Valentines Day. 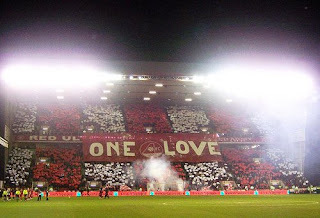 We had a full stand display with a huge polythene banner saying "ONE LOVE", that was another cracker. Do you have anything planned for the first home SPL game of the season (v Celtic) which EFW will be attending? We already have the display for Section Y planned for this game but I won't be revealing anything in this interview. You'll see for yourself on the day. I'm sure the visiting group from Celtic will have something lined up as well. It's our managers (Mark McGhee) first game in charge so hopefully it'll be an electric atmosphere. What chance do ultra groups have in the UK given the high ticket prices and the cost of travelling to see away matches? The groups all talk to each other and we have a UK Ultras website where we can all see what each group has been up to. We can also share stories about incidents at games with clubs, police, stewards etc. The fans in the UK are slowly getting used to witnessing more displays at games but but the 'club organised' crap you see at Chelsea and Arsenal isn't what it's all about. Fans 'doing it for themselves' gets more respect as it's a lot of hard work. Any new group gets plenty of encouragement from other ultras that are already on the go. It's very hard work and sometimes you have to go backwards to progress a little. I'd say to fans thinking of starting a group to be prepared for the long haul and to be very thick skinned indeed. Ultra groups vary from country to country. How would define 'ultras' in the UK? Do you think they differ from their European counterparts? They are only different as they can't express themselves as freely in the UK stadia. Some groups abroad are just plain crazy and wouldn't last 5 minutes with the UK policing. There's a few groups who have done some tremendous work in the UK and some displays have been at least on par with some of the big European groups work. The one thing lacking in the UK is official singing sections and standing areas. If we had these in the UK, groups could grow a lot quicker. The clampdowns begun big style in Europe on a lot of groups, especially in Italy. So where the the casual scene in the UK is more or less dead, it's thriving in Italy as the authorities come down hard on the ultra groups. They have to get permission from police and the local councils to display banners now and all the content has to be checked. It's not easy for them now over there but something we are used to dealing with over here....it's crazy! Do ultra groups in the UK have political tendencies? One group attached to Celtic 'The Green Brigade' are a political group but there's always been that kind of culture at Celtic since the day they were formed. At Aberdeen we are NOT political. We once got involved in the Fare Week, Football Against Racism. It's hard enough watching Aberdeen as it is without having to worry about bloody politics (Lol - Ed). What are the aims of ultra groups in the UK in general? Do you fight against high ticket prices, terracing, changing the kick off times, banning orders or do you just go for bigger and better displays and try to increase the atmosphere at games? We've shown banners against corporate favouritism, some against Setanta and Sky, others against high ticket prices. Football pay tv and corporate hospitality are killing the game but it's all about greed these days and the actual fan who goes week in week out is never considered by the clubs or tv companies. We have had members on banning orders for various things and still have one lad awaiting trial for something he never did. The same goes for a lot of UK groups. What are the relationships like between opposing UK ultra groups? On the whole relations are good. I've met lads from various groups and recently went as a guest of the York City Jorvik Reds to Wembley for a final. I'v e met with lads from Rangers and Celtic and had drinks and nights out with some of them. There's banter and sometimes it gets a bit silly between members of various groups north and south of the border but on the whole, we respect each other for what we are trying to do. Is there an age structure for UK ultras? Is it mainly young lads or can anyone join in? From what I see at our group, age doesn't really matter. We have had guys 50+ in the group and guys who bring their kids to games sometimes. 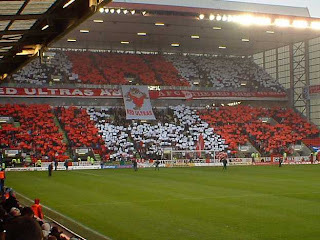 As long as you're Aberdeen and not afraid to sing and show your group/team colours then anyone is welcome. So there you have it. They sound like a great bunch don't they!? No violence just pure passion, just how we like it here at EFW. That has whet our appetite for our visit to Pittodrie and no mistake. In fact I have to do a little wee of excitement everytime I think about it. If you want further reading about the Red Ultras then head to their excellent website HERE and if you want to view a video or two of them in action then head HERE or indeed THERE.